We started in 2003 as a project to provide prom dresses to teenage girls whose families were financially challenged. Fourteen years later, Enchanted Closet has outfitted over 7000 girls and has saved families approximately $1,750,000. Our Prom Dress Giveaway Program has provided a solution for many metropolitan Atlanta families for whom prom season can become a dreaded time as they try to decide between spending a lot of money on a beautiful dress or on household and other school expenses. Since many teenagers today are being raised by single parents, grandparents and others on a fixed income, prom season can be a stressful time. With the support of our Celebrity Spokesperson and Fairy Godmother, Elle Duncan, formerly of V-103/CBS Radio in Atlanta and currently an on-air personality on ESPN, over 200 businesses and individuals in metropolitan Atlanta, and as far away as London donate to our cause. We set up our Prom Dress Giveaway Boutiques like a real department store with dress racks and accessory departments. Girls are given personal shoppers who create an extra special boutique shopping experience for them. Over 500 girls are provided with prom dresses, accessories, including purses, jewelry, wraps, and shoes annually, and they are transformed into “Belles of the Balls”. We believe that no girl should miss out on attending prom. It’s truly one of the most enchanting events in a girl’s life. 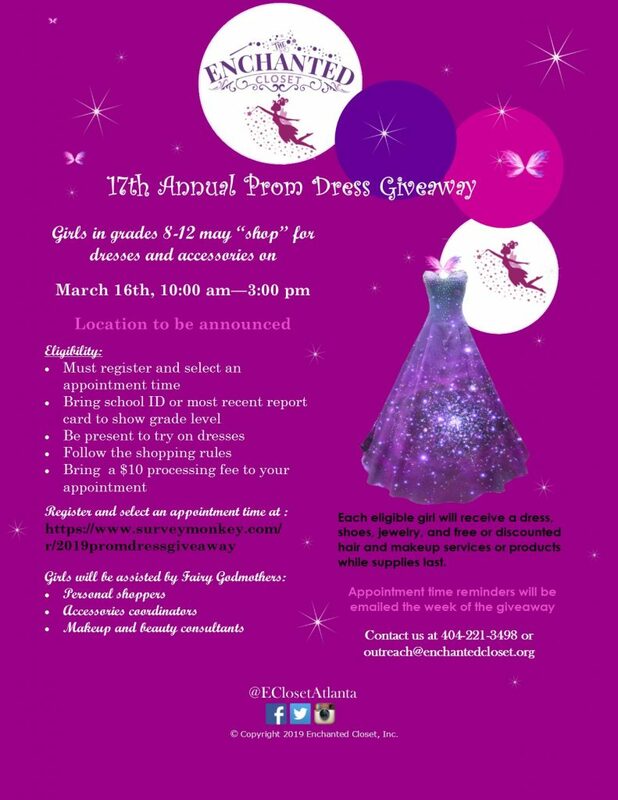 Girls in grades 8-12 are eligible to shop for prom dresses on March 16 from 10:00 am-3:00 pm at a location to be announced. Each eligible girl will receive a dress, shoes, jewelry, and free or discounted hair and makeup services or products while supplies last. Students must be in grades 8-12 and attend schools in the 14 surrounding metropolitan Atlanta counties. Each student must present a valid school ID card or other proof of enrollment at the time of the appointment. Volunteers will serve as personal shoppers for students attending the boutiques. Each student will be asked to wait until a volunteer personal shopper becomes available before she can begin shopping. Students will be allowed into the boutique based on their appointment times in groups of 10-15. Each student will be allowed to bring one adult (i.e. a parent, aunt, teacher, etc.) with her into the boutique. Other family members and friends may wait for students in the waiting area. By law, our volunteers cannot provide child care. Students will be allowed to select one dress, but can try on multiple dresses on the journey to finding that perfect dress. Once a dress has been selected, each girl will proceed to the accessory departments, and can not go back to try on more dresses. Students should remove heavy makeup and deodorant prior to trying on dresses. The organization will have wipes available for girls to use. Only the personal shoppers and other volunteers should handle dresses until a girl has checked out. Adults will not be allowed to shop for students without them being physically present. A $10 handling fee (cash) will be charged at check out.